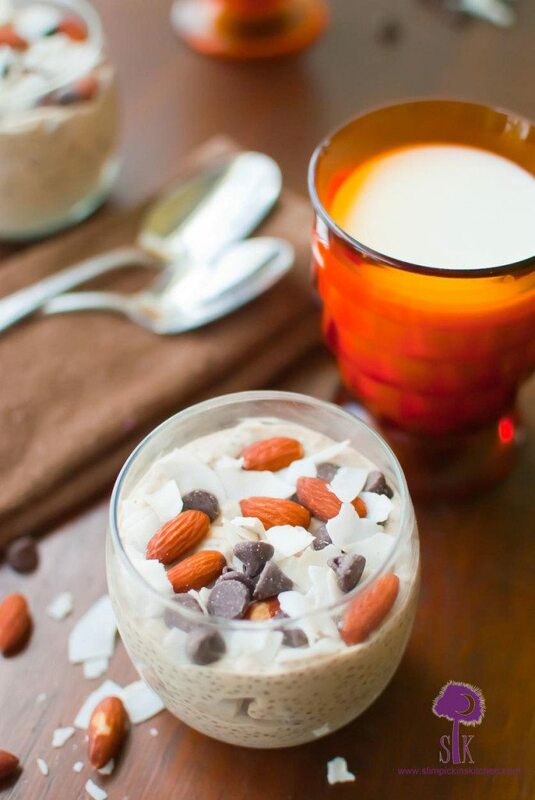 Behold the beauty of a perfectly dreamy chia pudding that tastes like an Almond Joy. 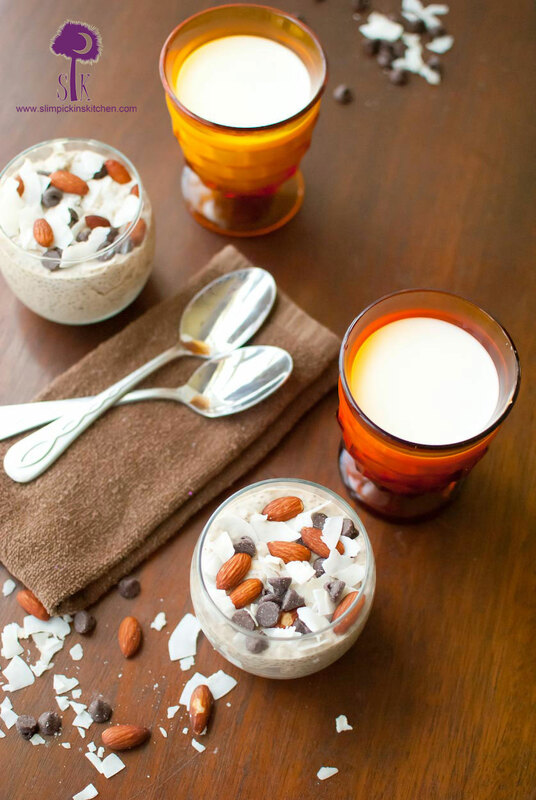 Loaded with sweet vanilla, tropical coconut, creamy chocolate chips, and salty roasted almonds, this chia pudding tastes like you’re eating dessert for breakfast, but you don’t have to feel guilty about it. I can totes get down with that. A few weeks back Mama F and I successfully completed the Whole30 challenge. If you’re looking for a kick start into a healthier lifestyle or a revamp of your diet, Whole30 is the place to begin. The diet basically consists of eating nothing but whole foods including fresh meats and fish, vegetables, fruits, nuts, and seeds. It is essentially a strict version of the Paleo diet which is a way of eating I truly enjoy. 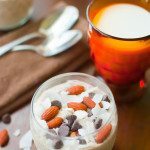 Even though I had to cut out major food groups including dairy and grains and a few other things like sugar and soy, I honestly thought this challenge was super simple to complete and it made me question every single thing I put into my mouth. It’s insane how many products contain soy and added sugars! Anywho, after losing 12 lbs and having a handful of cheat meals, I’ve decided to try to continue to eat as closely to the Whole30 program and the paleo diet as I possibly can. I have finally discovered that it is the best lifestyle choice that works for me. Want to know what doesn’t work for me though? Not indulging my sweet tooth with healthified sweets and treats which the Whole30 challenge absolutely banishes. Not having sweets for the rest of my life is completely impractical and if I did try to pull it off? 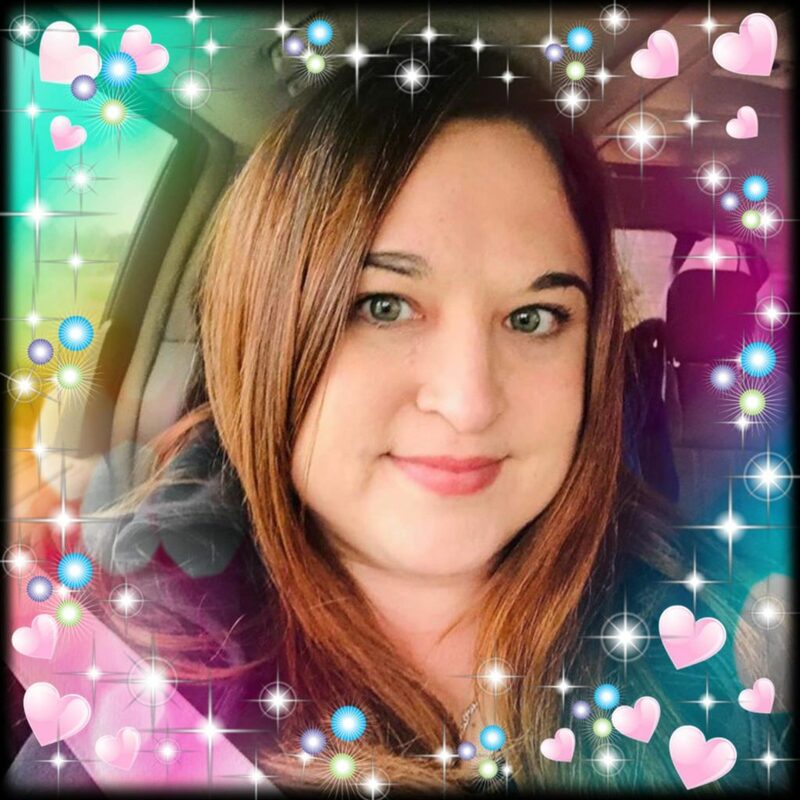 I’d end up sitting on the floor in the corner of my pantry mowing down on a pint of Talenti Sea Salt Caramel gelato and a bag of frozen cookie dough with mascara streaked cheeks as I blubber out “Alone” by Heart in between fistfuls of shoveling sugar in my face. Yeah, not a purty picture. So, yeah, I have to have sweets in my life, but that doesn’t mean I can’t keep them somewhat healthy with an occasional splurge at Dairy Queen or Cookout, ya know? The other day I had a chocolate craving, and at first glance I found nothing other than crap, crap, crap and straight up certifiable franken food in the pantry. 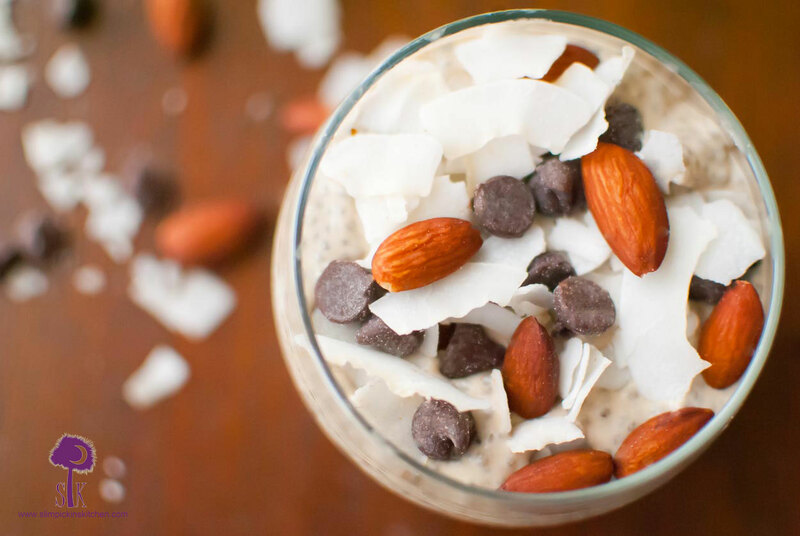 I eventually was able to pull together a few of my staples and I constructed a deconstructed almond joy made from shaved coconut, semi-sweet chocolate chips, and roasted almonds. Holy hell that shiz was good, and it is now my go to treat. 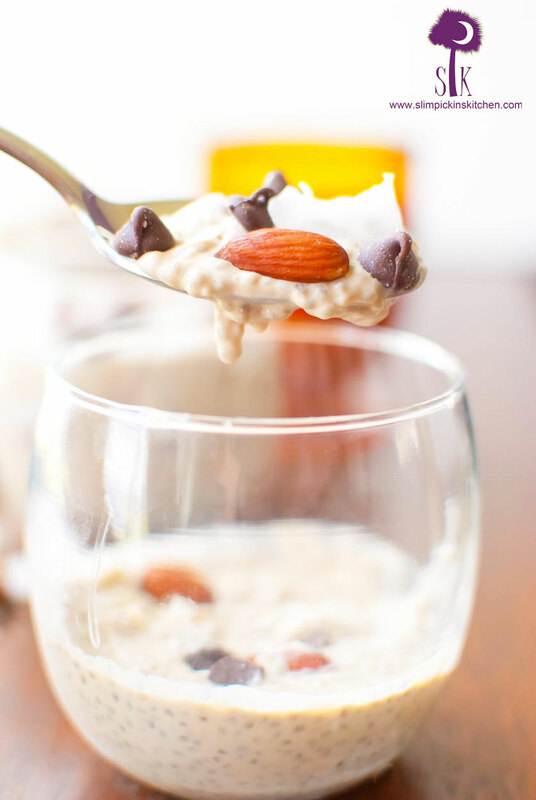 Combine all of the ingredients for the deconstructed Almond Joy and set aside, trying not to eat the entire bowl before the pudding is ready because this recipe makes enough for you to be able to swipe a couple of handfuls here and there. 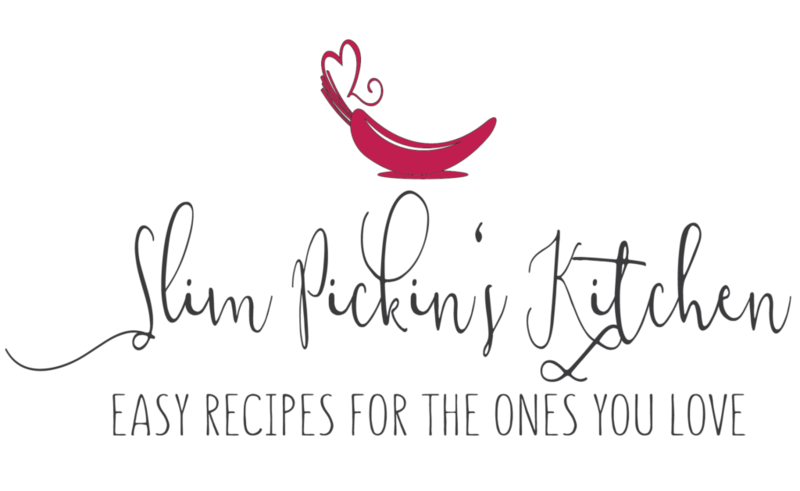 Stir together all of the ingredients for the chia pudding in a bowl until well combined. Cover with plastic wrap and place in the fridge allowing it to chill for several hours or, for best results, overnight. 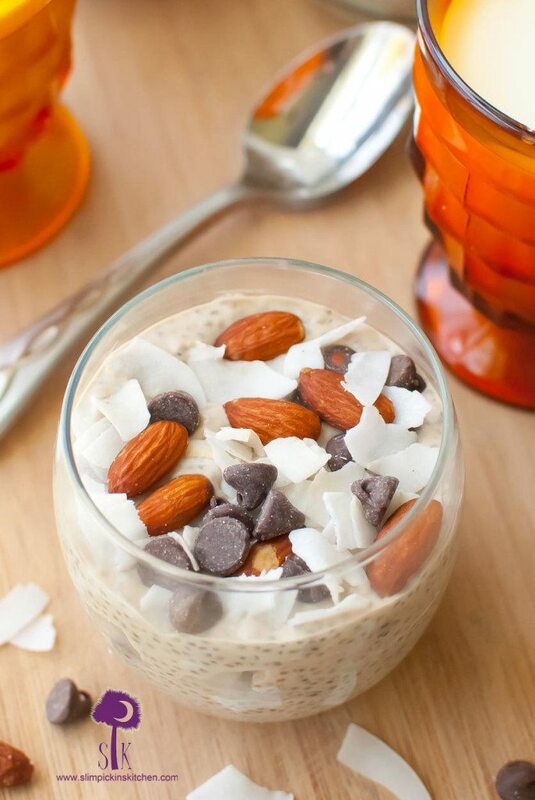 When the pudding is ready, spoon the almond joy mix and chia pudding in alternate layers in 2-4 glasses and serve. I can not even begin to tell you how amazing this looks. I LOVE Almond Joy! I am saving this to make later on.